U.S. Army Major Ed Pulido travels the country on behalf of Folds of Honor Patriot Day events. The Detroit News Hole-in-One Contest has 70-plus years of history in Metro Detroit. In 2009, the Golf Association of Michigan, http://www.gam.org/, joined forces with the Folds of Honor Foundation, http://www.foldsofhonor.org/, to become part of statewide Patriot Day golf events, which raise scholarship money for the children of military veterans who were either wounded or killed in action. The children of Major Ed Pulido, pictured here, were some of the first recipients of college scholarships. This year, the annual contest at Whispering Willows GC, located on Newburgh Rd. and 8 Mile in Livonia, on September 5, 2012 from 7:30am until 5pm will enjoy special recognition as an official event of the U.S. Navy’s War of 1812 Bicentennial Celebration, September 3-10, when an armada of Navy and tall ships will be moored along the Detroit and Windsor Riverfronts. Navy personnel from several ships will be on hand to participate. Dozens of other public events will take place throughout Metro Detroit. For a complete listing of scheduled tours, concerts, and events, please visit http://www.ourflagwasstillthere.com/ or http://www.1812detroit.com/. The public is invited to attend this annual Hole-in-One event. Three golf clinics will be offered: a Family Golf Clinic for veterans, active military and their families, which will be conducted by PGA Professional Paul Worley and staff from 11:15am – 12:45pm. 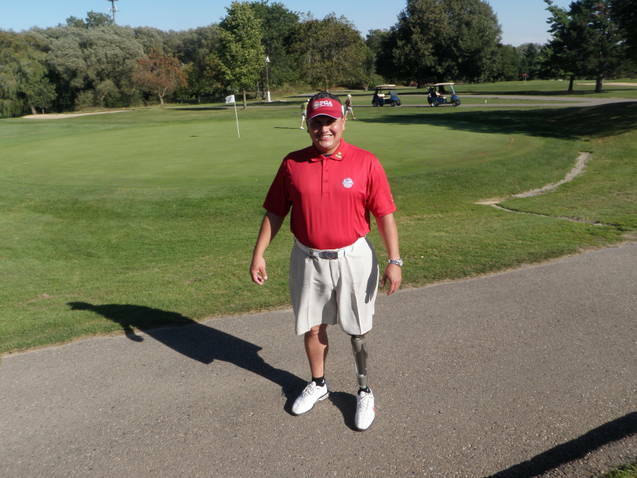 ‘Adaptive Golf’ Clinics will be presented by Co-Founder of Michigan Adaptive Golf and PGA Professional Joe Portfilio from 10-11am and 1-2pm for those who have suffered illnesses or injuries and would like to be able to play golf again. Specialty golf equipment will be provided. Any golfer who has made a regulation ace is eligible to enter the contest, which consists of hitting two shots at an ace on the par-3 7th hole. There are several age and gender divisions where prizes will be awarded. For info: www.detroitnews.com/section/sports04; To sign up directly, email: golfevent@ymail.com with your name, address, phone, email, age, gender, time preference, and course where the ace was made. Raffles will be held for several prizes, including the use of a Chevy Volt for a weekend, courtesy of Marty Feldman Chevrolet. Donations to the Folds of Honor will be accepted throughout the day.